I loved, loved this show that came to us like an intimate theater piece. No abundance of locations. Just a few, well chosen ones. This gave space for the characters to develop and for the actors to shine in I’m Not A Robot (로봇이 아니야) (MBC, 2017-18). And it gave space to the storyline. A story that had a clear gender bending bend. 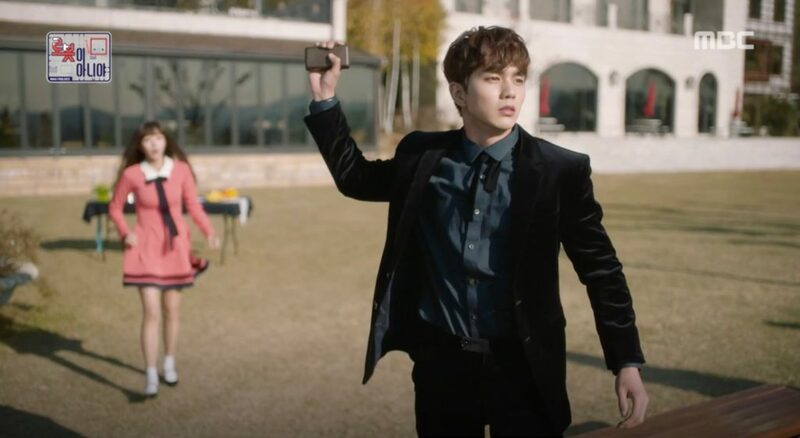 Yes, Kim Min-Kyu (Yoo Seung-Ho) is a awesomely rich. Yes, he has an awesome and huge house. But he is also, like Rapunzel in her tower, trapped in this house because of his human allergy. It is he that needs to be rescued and not him that will rescue a plucky heroine. And, once rescued, he doesn’t rely on the heroine. He starts to rescue himself. Also, living in his ‘tower’ for 15 years and having been betrayed by his best friend and the father of that friend, he would have had all reasons to become mean and spiteful. But he didn’t. He still believes in the good sides of people, helps them out and also reaches out. He supports the people around him to get the best out of them instead of making them follow his rule. 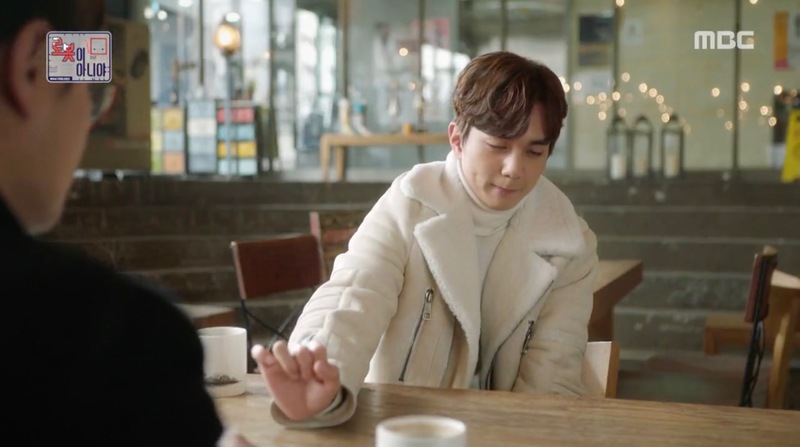 In such, I’m Not A Robot is also bending drama-tropes and especially the dominant narrative trope of mean, wrist-grabbing chaebols and clunky candies that need to be saved à la Boys Over Flowers or The Heirs. So let’s raise the curtains and introduce the main filming locations. And of course, as a theater piece deserves it, I’ll do this in stages and acts. Of course, there is Kim Min-Kyu’s mansion. The main place. In reality, this is an amusement park named after the bears that are the main attraction of the park. 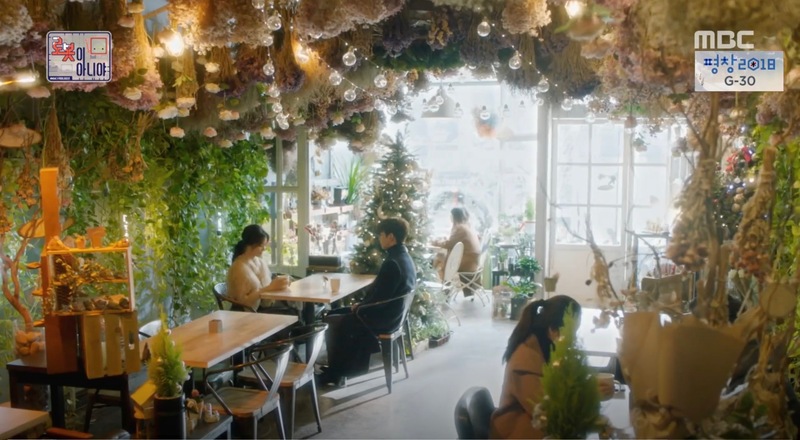 Equally important is Jo Ji-Ah’s (Chae Soo-Bin) best friend’s Sun-hye (Lee Min-ji) café ‘Summer Snow’ – in reality The Dalda Cafe [더달다] — where important conversations take part and Ji-ah finds refuge. 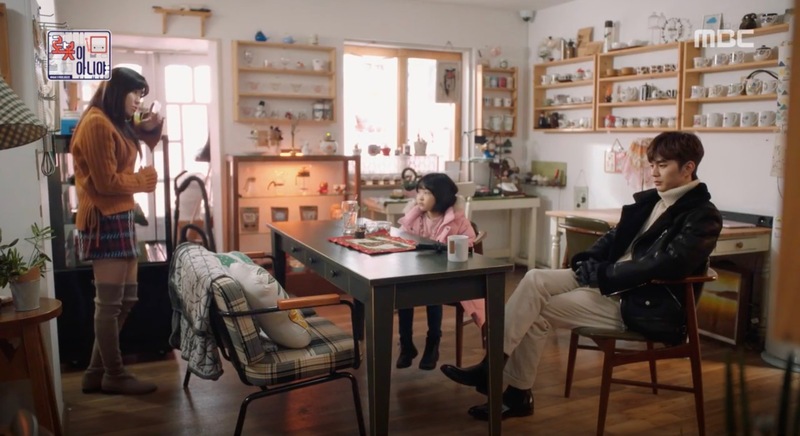 Most of the main characters pass through this café at least once in the drama. Falling in love, often means also falling out of your (first) love. This is especially true for Min-kyu who dreams of a relationship with his first love Ye Ri-El (Hwang Seung-Un) — who in turn is in love with Min-kyu’s opponent Hwang Yoo-Cheol (Kang Ki-Young). But not only Ri-el’s non-interest in him hinders this relationship from happening. It is also Min-kyu’s allergy against humans; upon touching a human he’ll have horrible skin break-outs and difficulties to breath; not the best condition to enter a relationship, I’d say. 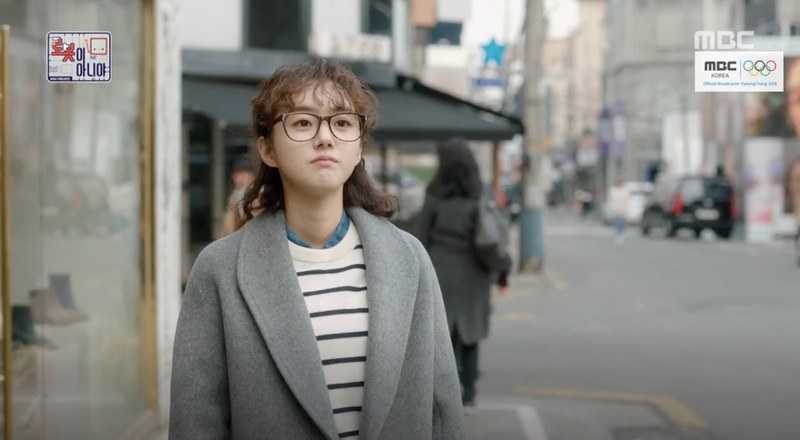 But falling in love can sometimes also mean to — and especially in K-Dramaland — to get rid of your (clingy – fortunately not in this drama’s case) ex-lover. So even if Ji-ah is over her ex-boyfriend Hong Baek-Gyun (Uhm Ki-Joon) since a long time, he hasn’t found closure and still hopes he can get back together with her. This was also the main motivation for him to make the robot, Aji3, that he has built with his Santa Maria Team to look exactly like Ji-ah. He had hoped to understand why they broke up in building a very human-like robot and communicating with it. This done, he wanted to rebuild his and Ji-ah’s relationship. But it turns out, in understanding her, he understands as well that they won’t make a good pairing. This helps him, in turn, to open up his heart to somebody very close to him. But for now, let’s stay with our main couple. We can’t really say that Ji-ah and Min-kyu were off to a good start. They both meet for the first time as client and vendor in episode 1. She is President Jo and he ordered a limited edition robot from her. 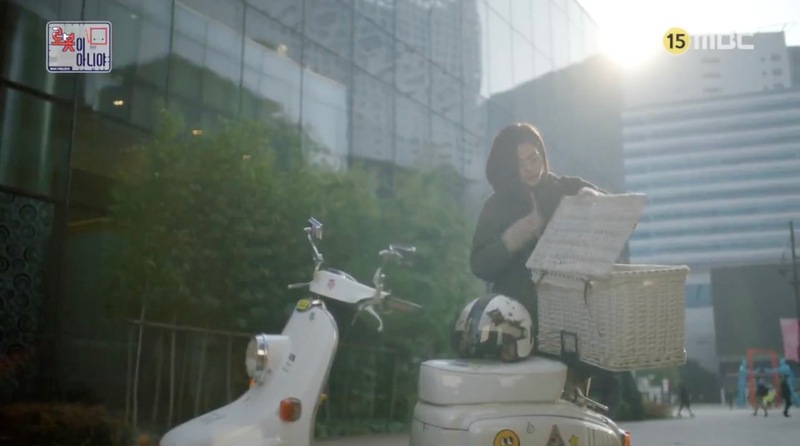 Ji-ah, after a lot of struggle gets her hands on the robot, close to Sangam Cultural Square [상암문화광장] where she has had parked her scooter and happily let’s Min-kyu know about it. But when they meet up at Nodeulseom [노들섬] for the transaction he refuses to pay because the packaging is not faultless. Ji-ah is annoyed, of course, and vents her anger over Min-kyu at Bamsom Park [밤섬공원] right afterwards. 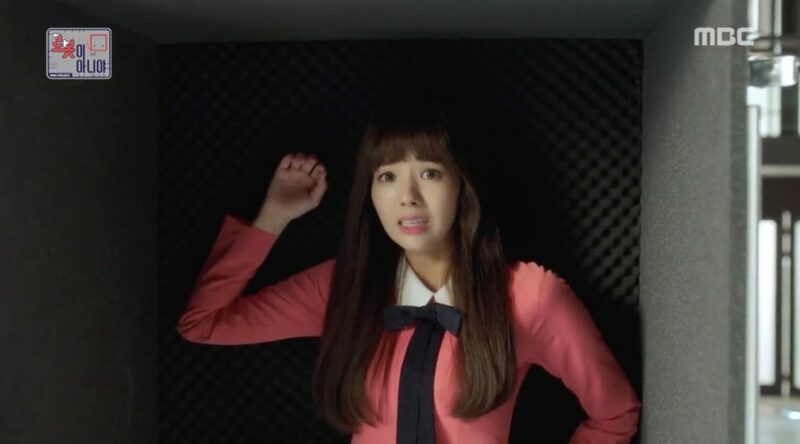 So when Ji-ah ‘disguised’ as Robot Aji3 enters Min-kyu’s house, we understand why she is shocked to see him; he in turn thinks how great the robot must be if it has those human-like reactions. Min-kyu then gets more and more used to have Aji3 around him. She is quickly upgraded to a ‘pretty’ — the highest rank in Min-kyu’s system of classification of his robots — and she’s ‘ordered’ to follow him everywhere. Which she does. As every good robot does. So first thing we see is that Min-kyu takes Aji3/Ji-ah with him to his D-day date with Ri-el in episode 9 at Praum [프라움레스토랑]. Ri-el has just come back from abroad and Min-kyu wants to finally propose to her. He has everything thought through. From the place, the drinks, the cup for Ri-el (a present from Ri-el when they’ve been children) to the jewelry (a necklace from his mother). But Ri-el rejects the proposal, wants to stay friends and leaves a dejected Min-kyu behind. On their way back Min-kyu stops the car and Ji-Ah proposes to take a walk at Gyeongui Line Forest Park [경의선숲길공원 / 경의선공원] to cheer him up (also in episode 9). Everything is so flawless and in a flow between them that it seems as if they are on a date without being on a date. But most importantly, this is when Min-kyu realizes the positive effect that Ji-ah’s (aka Aji3) presence has on his allergy and he embraces her and kisses her on the forehead. But in reality, Min-kyu is not a good kisser. He has never learned it and wants to be prepared for it to happen (with Ri-el as he still hopes). So he engages Sun-hye — Ji-ah’s best friend — to teach him. Ji-ah (as Aji3 of course) becomes the guinea pig to teach Min-kyu to know when the right moment has come to lean in for a kiss. The lesson seems to take place in Min-kyu’s garden but was actually filmed at The Garden of Morning Calm [아침고요수목원]. A couple of days later, in episode 12, Min-kyu is back at Gyeongui Line Forest Park [경의선숲길공원 / 경의선공원] with his first love Ri-el and desperately wants to reproduce his afternoon with Ji-ah. But everything that he and Ji-ah had liked and had made them giggle and be happy, is what Ri-el finds boring, uninteresting, and not amusing at all. Finally she leaves abruptly when drunk Hwang Yoo-Cheol (Kang Ki-Young) calls her to join her. 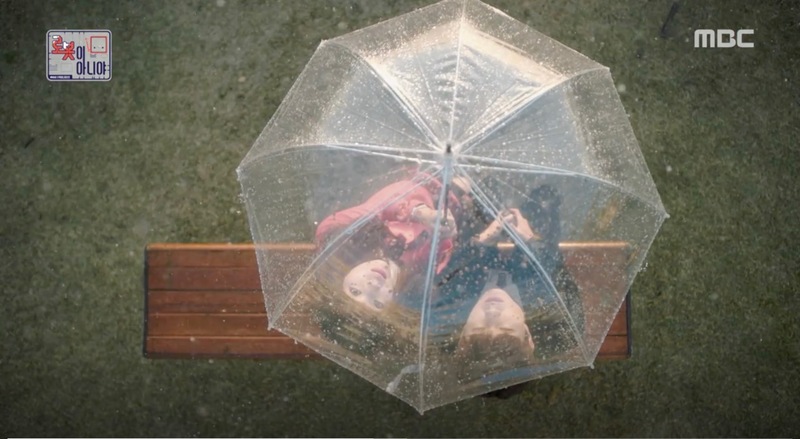 When Ji-ah and Min-kyu are alone, it suddenly starts to rain and Min-kyu gets his umbrella ready. He cannot know that is one of Ji-ah’s umbrella prototypes that he holds over their heads and that she is head over heals when he says he wants to meet the person who has invented it. Next thing we know is that Ji-ah kisses Min-kyu saying “This is the right moment.”; making reference to Min-kyu’s kiss lesson earlier. We already know that Ji-ah has only eyes for Min-kyu by now and has long gotten over her ex-boyfriend Hong Baek-gyun (Uhm Ki-Joon). He, on the contrary, still hangs onto her. But it is not so much Ji-ah that he seems to be still interested in but rather in understanding why she broke up with him in the first place. When both of them have dinner at Luka 511 [루카511] in episode 16, he finally understands — a first step for him to move on too. In episode 21, we learn that the same thing happens to Min-kyu and Ri-el at nearly the same time at Ri-El’s favorite café Arriate Tea House [아리아떼]. Both of them decide to make a clean cut and stay good friends. She confesses that, “as we meet people and as we go through experiences, we learn about our real selves” and that she is sure that his necklace will find a good owner. In episode 24, Ri-el is back here; this time with her father, trying to convince him to re-think her marriage with Min-kyu which her father basically forces upon her without her consent. I really appreciate how in the middle of the story we get a relatable transition that comes two-fold. 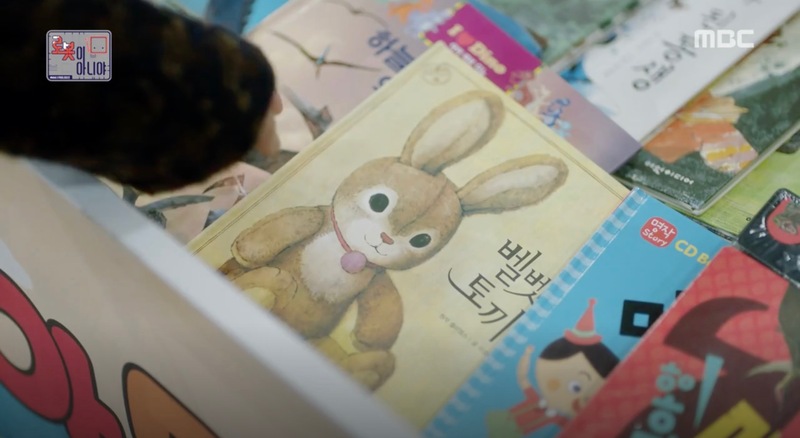 First, we get the storyline for the following episodes laid out in front of us when Aji3-Ji-ah presents Min-kyu with a story of the children’s book Velveteen Rabbit, which was taken up in the following episodes with a little, but important twist. And second we get a change of place. 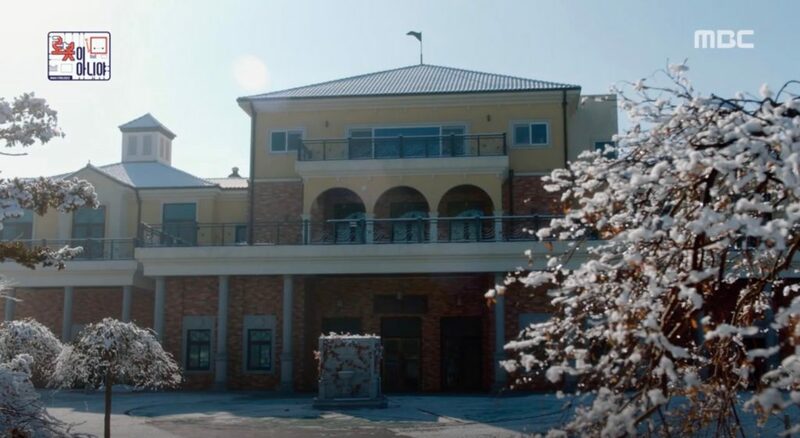 Min-kyu’s mansion is — for a few episodes — replaced by Ji-ah’s grandmother’s fish restaurant Su-san Jayeonsan Hoejip [수산자연산횟집]. 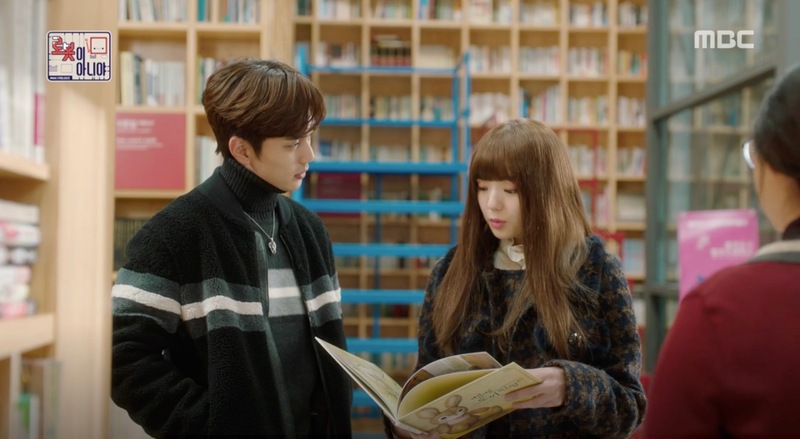 So in episode 19, Min-kyu comes to Forest of Wisdom [지혜의숲] — Library with Ji-ah on their last human-robot date. Ji-ah stops in front of the book Velveteen Rabbit, which narrates the story of a a stuffed rabbit that is the favorite toy of a boy who comes to think that the rabbit is a real rabbit. Later, the boy nevertheless abondons the stuffed rabbit. It meets a fairy that makes it alive and real. When the boy sees his stuffed rabbit the next spring now as a real rabbit, he doesn’t recognize it. In episode 20, when Min-kuy had already said goodbye to Aji3 and made her reset, he comes back here to read the book only to decide that he would not be like that boy and always be able to recognize Aji3; even if she comes alive. 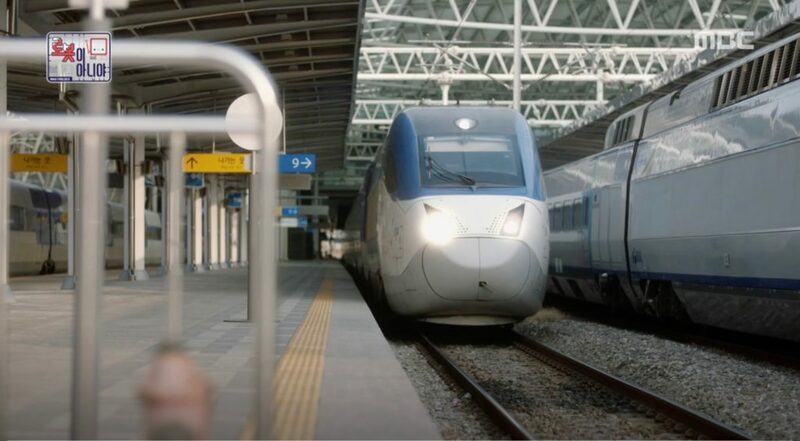 And then they both depart by train from Seoul Station [서울역] on episode 20. 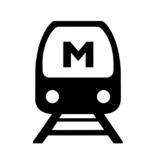 Min-kyu heads to a meeting and takes the train (instead of the car) for a change of air and love-sick and desperate Ji-ah is taking the train to go to her grandmother’s, also for a change of air. 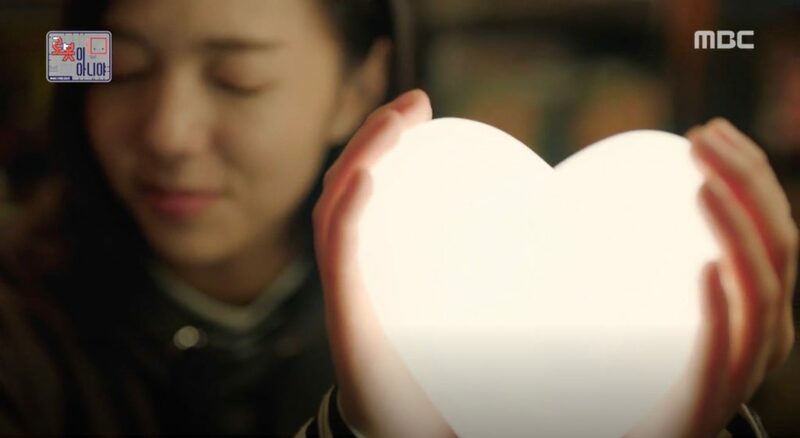 Actually Ji-ah had hoped that she could finally tell Min-kyu the truth after the reset and the Santa Maria Team had helped her to push through with exchanging her with the real Aji3 as quickly as possible. But then everything got complicated and everyone (including Min-kyu’s doctor) decided that it’s best to never tell Min-kyu the truth in fear that his human allergy would come back and eventually kill him. But back to the moment in the train. Because this is when Min-kyu is by coincidence sitting opposite of real life Ji-ah and can’t take his eyes from her. Only until another passenger tells him that he is sitting on a reserved seat (as Min-kyu had missed his station). He leaves and finds our over phone that Aji3 was modeled after real life Ji-ah. All of this makes Min-kyu not go to his meeting but to follow Ji-ah to her grandmother’s restaurant Su-san Jayeonsan Hoejip [수산자연산횟집]. He’ll observe her going to the restaurant and also buying fish at Geoje Suhyup (National Federation of Fisheries Cooperatives), Gujora Joint Market [거제수협구조라공판장]. And he really tries very hard to talk to Ji-ah while she tries very hard to push him away. But he won’t leave and books a night at the restaurant’s rooms with Ji-ah’s grandmother. He is amazed in seeing Aji3 in human-form and seeing her doing simple things like eating and drinking that Aji3 couldn’t do. 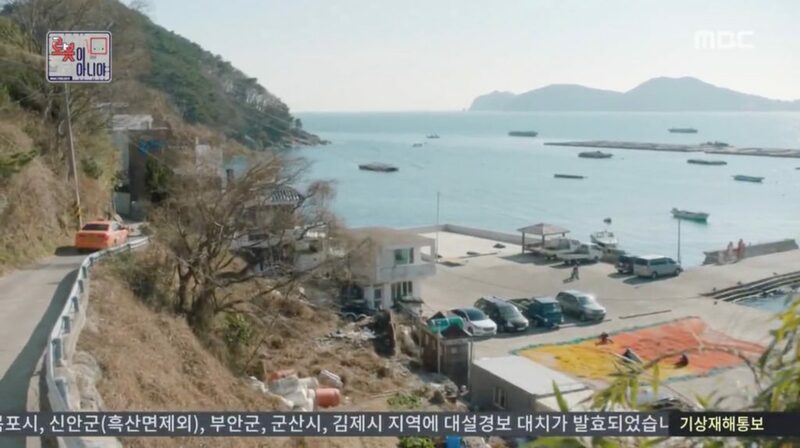 It is also Ji-ah’s grandmother who ask Min-kyu to tag along Ji-ah, when bringing back the cart to Geoje Suhyup (National Federation of Fisheries Cooperatives), Gujora Joint Market [거제수협구조라공판장] in episode 22. This is also when they both get locked in and have to spend the night together. Especially Ji-ah is uncomfortable at first and then notices that Min-kyu doesn’t make a connection and she can tell him everything she wanted to tell him all this time without blowing her cover. And they talk and talk. Until they both fall asleep. In episode 24/25, the Santa Maria Team comes over to help Ji-ah separate from Min-kyu and they are able to convince him to go back with them. But next thing they know is that Min-kyu has gone AWOL. 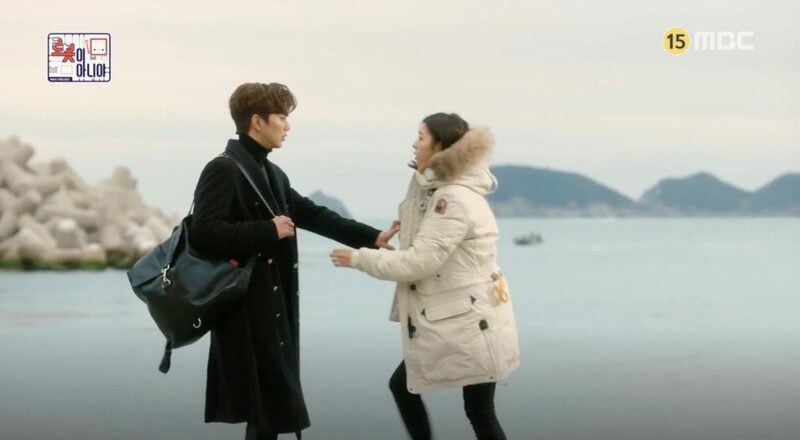 In fact, he has rushed back looking for Ji-ah and eventually finds her after frantically crossing the Yeocha Breakwater at Yeocha Mongdol Beach [여차몽돌해수욕장] where Ji-ah is tearfully sitting by the seaside. But his happiness in finding her soon turns into shock when he sees her wearing the necklace he had given to Aji-3. He slowly understands that he was duped, and his allergy re-emerges before he realizes it. He is rushed back home and treated. Putting the pieces of the puzzle together, he feels (understandingly) betrayed and shuts himself off from everyone. But Ji-ah insists. She wants to explain herself. She comes by his house every day to bring him food (she has learned cooking for him). And finally they meet up at Mt. Seongheungsan Love Tree [성흥산 사랑나무] in episode 26/27, clearing their misunderstandings and starting their new relationship with a kiss in a meteor shower. 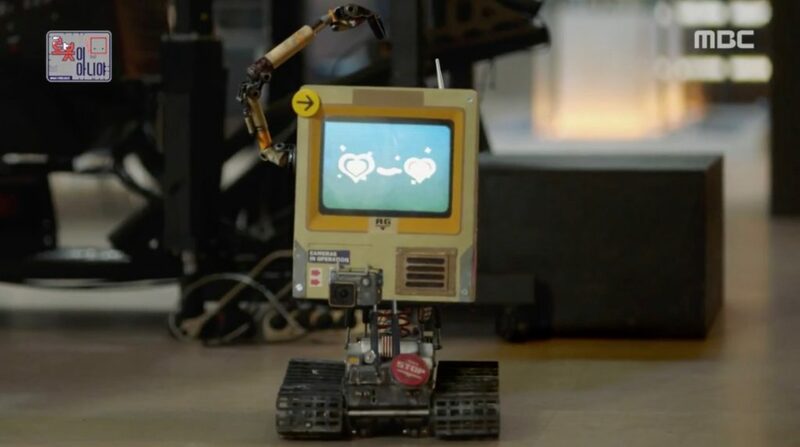 I like it how Min-kyu’s and Ji-ah’s love story has also effected the development of Aji3, the real robot. 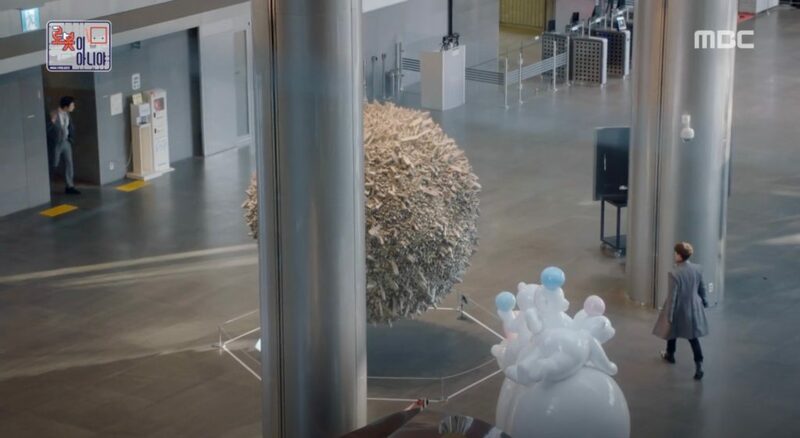 It was their love that made robot Aji3 a robot with morals (being against war and acting against discrimination), as we see when she ventures out into the world on here own in episode 29 and when makes a halt at Gaon Culture Park [가온문화공원]. It’s a nice moral twist here in making us think about our way of treating and living with robots. Apart from this main love story, we also had other people falling in love in this show. We had Ji’ah best friend Sun-Hye and Santa Maria team member Hoktal (Song Jae-Ryong). Their main (and cute) love story happened at The Dalda Cafe [더달다] where Hoktal became a regular. And, of course, we had Santa Maria team leader Baek-gyun (Ji-ah’s ex-boyfriend) and his team member Pi (Park Se-Wan). What I really liked here was that Pi decided to do a make-over on her own. No man that dragged her around shops and beauty salons. She wanted that change herself and took it into her own hands and went shoe shopping at Marie mon dieu [마리몽듀] before getting her curls straightened out. And on top of that her new look was secondary to Baek-gyun and his love for her. Finally there are Min-kyu’s childhood friends Yoo-Cheol and Ri-el. When coming back from her studies abroad, Ri-el understands that she is in love with Yoo-cheol who was always at her side and knows her best. However it takes some time until they get together as Yoo-cheol flirts with the evil until he turns around in the last instance. We usually see Yoo-cheol fighting a fight inside and if not at the company he is usually at bars and Ri-el often joins him and sets his head straight; as in episode 21 and 31 at Winebar Claret [클라레]. 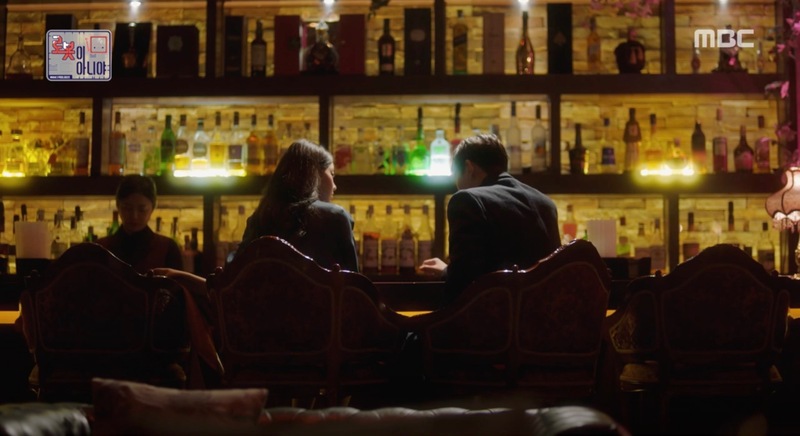 And seemingly naturally it is also at a bar, at A.Y Lounge Bar [에이와이 라운지], where Yoo-cheol proposes to Ri-el in episode 13 (but we see this only in a flashback in episode 16). The last love-line I’ll mention here is the bromance that builds up between Min-kyu and Ji-ah’s brother Mr. Jo Jin-Bae (Seo Dong-Won) who has also become Min-kyu’s right hand at his company. 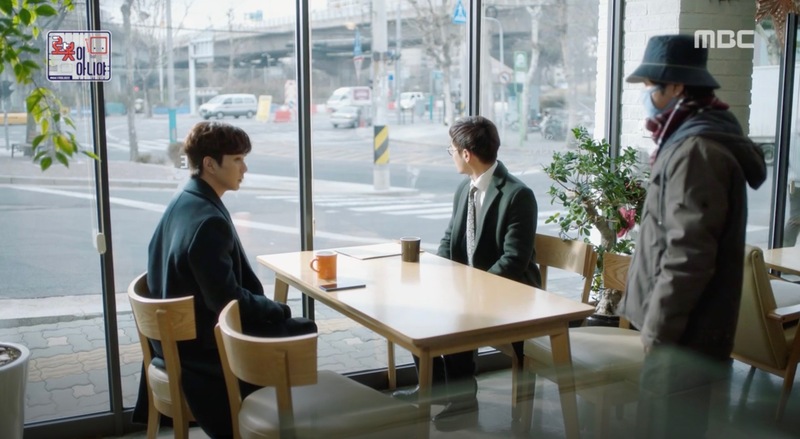 Things get complicated when Jin-bae hands in his resignation letter and some nice misunderstandings follow Min-kyu’s reluctant acceptance of that latter at Green Cloud Coffee Shop [그린클라우드커피] in episode 31. Well, this is not really a stage. But most other places in I’m Not A Robot have to do with company things and — in Min-kyu’s case — mainly to prevent being taken over by Yoo-cheol’s father and getting thrown out of his company. So we see a lot of meetings related to the Santa Maria Team — that is crucial in the fight over the company — and also meetings with informants so that Min-kyu can secure his position as a director of his company. 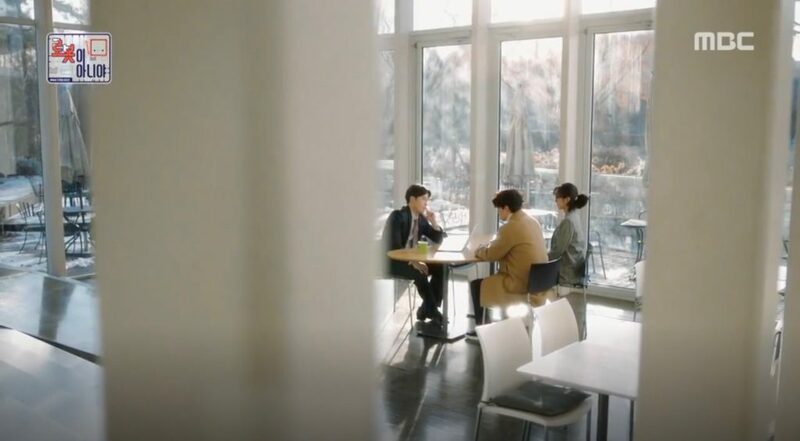 It starts out with Baek Kyoon having a business meeting at Gallery White Block [화이트블럭] to get funding for the Santa Maria Team in episode 10. 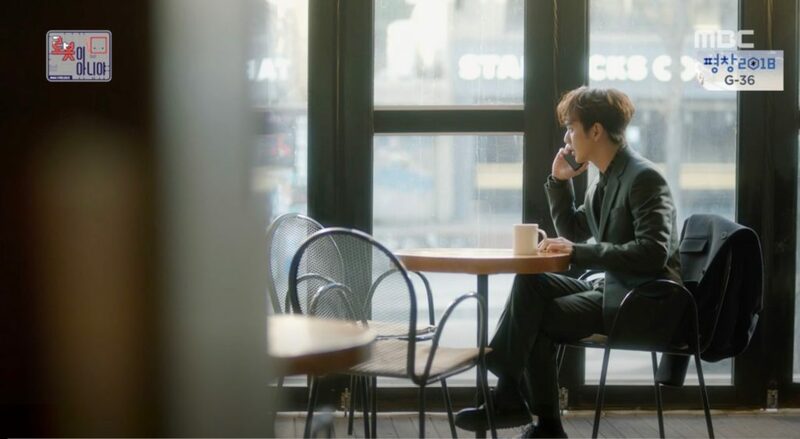 Min-kyu on his end, tries to meet with an informant at Coffeesmith — Hongdae Branch [커피 스미스 홍대점] at episode 20. 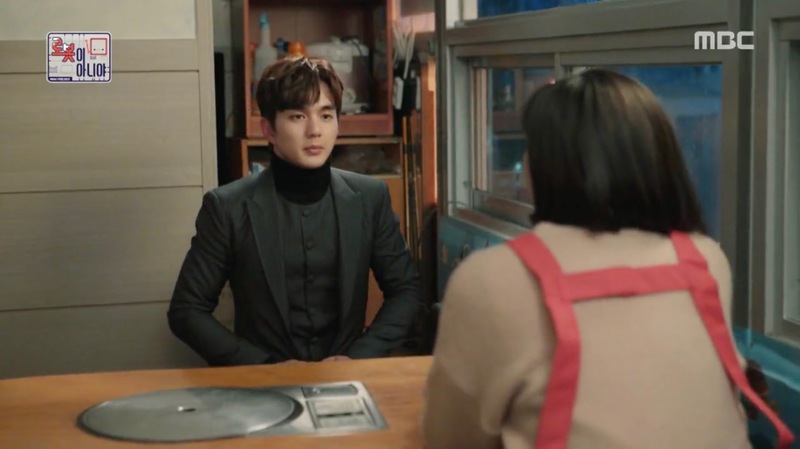 And he finally makes the meeting happen at Café Skene [스케네] in episode 29. 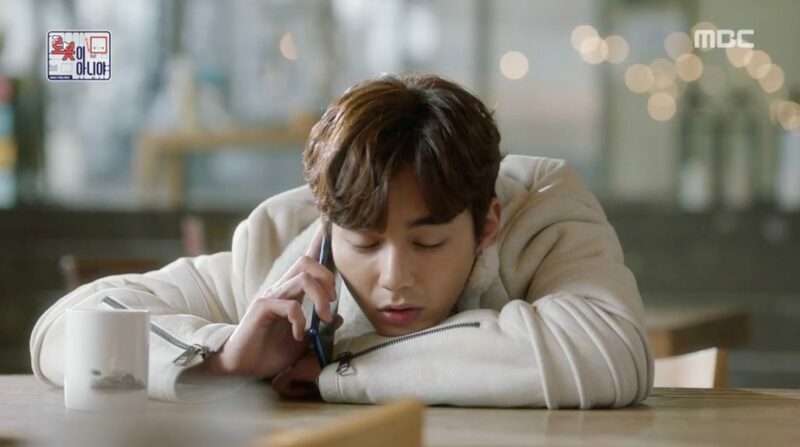 Min-kyu also has a couple of meetings in the final episodes to safe the Santa Maria Team for which he meets with Madame X’s secretary two times at Pattern Ethiopia [패턴에티오피아]. Thanks Min-kyu for giving us another thoughtful nice guy that loves to cook (that you are rich doesn’t hurt, but it’s agreeable that you don’t show of with it) in K-Dramaland. Thanks Ji-ah for staying independent, strong and true to yourself even when being together with Min-kyu (and for once we have a candy that doesn’t know how to cook). Thanks Yoo-Cheol and Ri-el for standing up against your parents and following your consciousness. Thanks Pi for taking the re-looking into your own hands. And thanks Aji3 for becoming a cool robot. Awwww, many thanks 🙂 I’m happy this made you smile. And yes, your comment makes me think that it is also the smile-factor of IANAR that makes it a stand-out drama.